Scores demonstrated in front of the White House in Washington, DC with banners, demanding "Stop racism and the war machine at home and abroad." Rallies and marches also took place in Los Angeles, Philadelphia, Portland, Sacramento and other US cities. — joe piette (@pastpostal65) 14 апреля 2018 г. — Delka Nenkova (@DelkaNenkova) 15 апреля 2018 г. More are to come on April 15 and within the next week in New York City, Las Vegas and other American cities. The activists spread the word about the protests online, calling for more action on Facebook and Twitter. 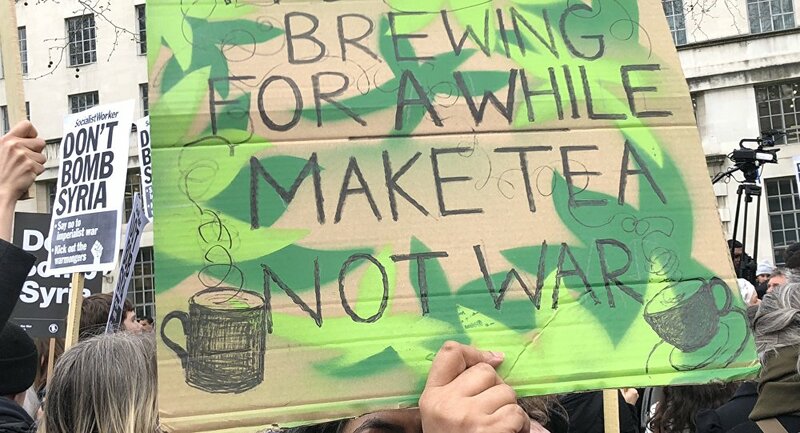 People in the UK, which also took part in the attack on Syria, staged their own anti-war and anti-racism marches and rallies in London, Liverpool, Manchester, Cardiff and others. — Dan L (CWU NW Chair) (@Think_Become) 15 апреля 2018 г. — andy barton photo (@Andybartonphoto) 14 апреля 2018 г. — Southerngirlsammy (@slezzapezza) 14 апреля 2018 г. — David Ll Davies (@DaiLlDavies) 14 апреля 2018 г. — Manchester SWP (@mcrSWP) 13 апреля 2018 г. On April 14, France, the United Kingdom, and the United States launched strikes on a number of targets in Syria in response to the alleged chemical attack in Douma, Syria. The Syrian leadership, in its turn, denied any involvement in the attack, and invited the experts from the OPCW to investigate into the reports. The coalition forces launched over 100 missiles in Syria, most of which were shot down by Syrian air defense. The OPCW press service said that the organization's mission had arrived in Damascus. A Syrian government source told Russian reporters that OPCW experts were planning to start their activities in the Syrian area of Eastern Ghouta, where a chemical attack allegedly took place.